Hi guys. Today I’m writing about the Seiko SNZF17 review, or the so-called Seiko Sea Urchin watch. It’s also widely known as poor man’s Rolex Submariner for its Submariner-inspired design – and no, I’m not talking about the Invicta 8926 here. While the Invicta blatantly copied the Submariner design, this Seiko SNZF17 injects Seiko’s own design characteristics (specifically Seiko 5 Sports design) to make their own dive watch style. This is one of the reasons why Seiko (and other Japanese watch brands) are respectable in this field. Their willingness to ensure their products have identity and not just a cheap copycat of a popular watch is commendable. The end result is a watch that looks like the real thing but at a very affordable price (for an automatic watch that is). And I can’t praise enough how it still has its own identity. For me, that’s the paramount aspect that a watch need to have. Why Does The SNZF17 Has The Sea Urchin Nickname? First things first, why the Seiko SNZF17 is dubbed the Seiko Sea Urchin? Frankly speaking, I’m also not sure why this is so. But from what I can gather, the watch is called as such because of its resemblance (somewhat) to the sea urchin. 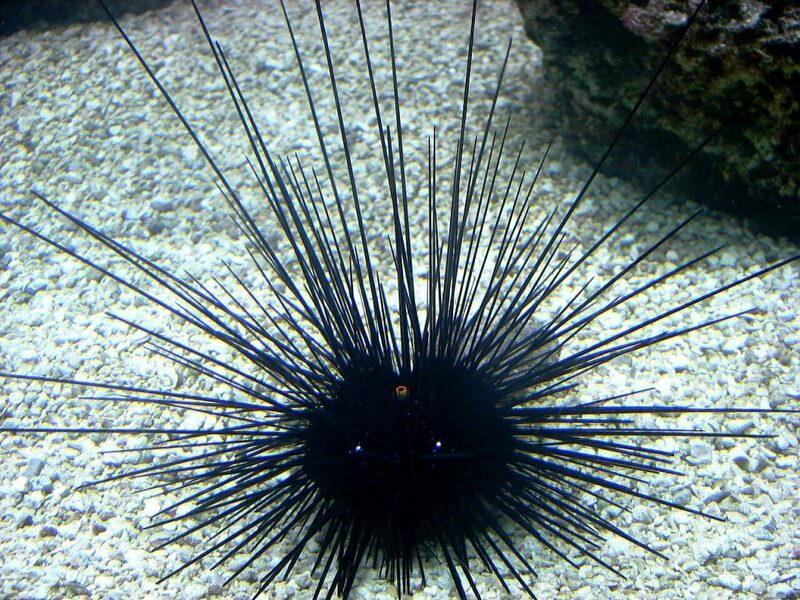 Above is a your normal sea urchin. Hmm.. See any resemblance to the Seiko SNZF17? I mean both are black in color, and the Seiko SNZF17 has that white marker lines that looks just like the spike coming from the sea urchin LOL. Without further ado, let’s go to the Seiko SNZF17 review shall we. Quick Summary A good value for money automatic watch with resemblance to the iconic Submariner – with Seiko’s own identity of course. With such price tag, it’s own of the more affordable auto watch that can be bought making it perfect for those wanting to try the magnificence of automatic watch. There are many watches out there that has the iconic diver’s watch look of the Submariner. Well, we can’t blame them. Index markers, unidirectional rotating bezel with minutes on it, black and white color scheme, stainless steel case, lume applied lavishly on the hands and markers – these are the elements that’s perfect for a diver’s watch. 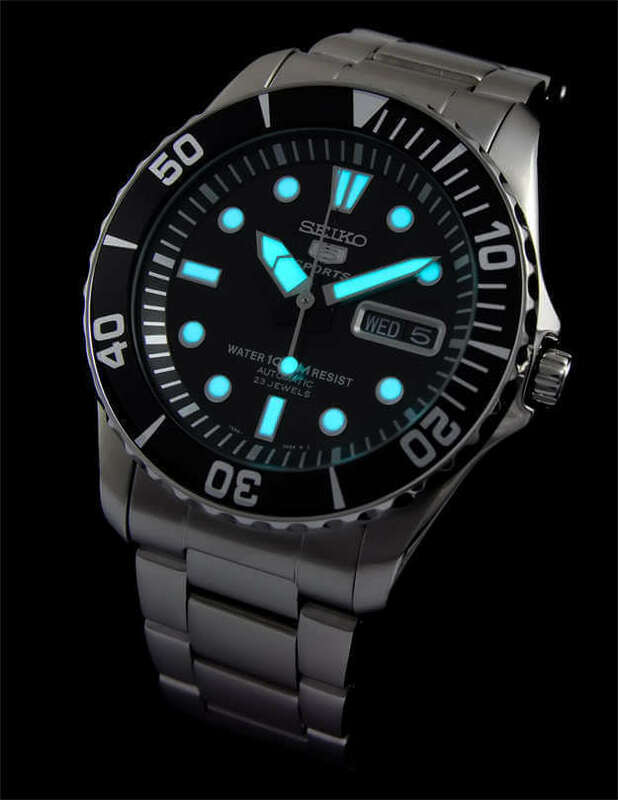 In fact, some of these (such as the rotating bezel and lume) are the requirements for a watch to comply with the ISO diver’s watch specification. Which is why if you ask me, it’s quite impossible to make a good diver’s watch without making it look similar to the Submariner. Practically almost every major watch brands have one of these and Seiko is no exception. Their line up of diver’s watch such as the SKX007, SBDC033, SKX173 and SRP777 have their own distinct design. But this Seiko SNZF17 is the one watch that closely resembles the Rolex Submariner, albeit with slight changes to incorporate Seiko 5 Sports’ identity in it. The most glaring similarities between these two watches are the index markers, bezel and dial signature. The index markers of the Seiko SNZF17 are a combination of circular and rectangle markers. Rectangle markers are used at the 6 and 9 o’clock positions while the 12 o’clock is using a trapezoid shape marker. 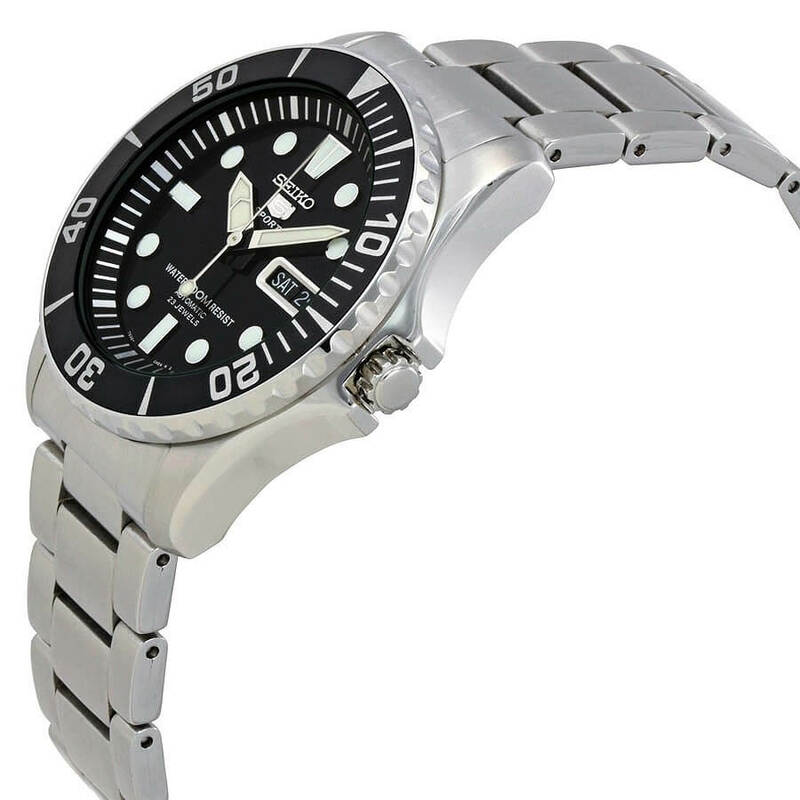 The bezel of the SNZF17 is a unidirectional rotating bezel type that’s common with diver’s watches. For those that are not familiar with it, it means the bezel ring (the one with the 10, 20, 30, 40 and 50 markings) can only be rotated counter-clockwise. This is so that it can be used to time dive duration easily (read my guide on how to use these HERE). As you might have noticed, the bezel markings are almost similar to the Rolex in terms of its placement though the font is bigger. Lastly, the dial signature design on the Seiko SNZF17 somewhat resembles the Subs due to the placement of texts at the bottom of the dial. I never see any Seiko 5 with this placement design, so I guess Seiko did do it in purpose to mimic the Rolex LOL! Similarities apart, the Seiko SNZF17 do have its own identity, characteristics taken from Seiko 5 Sports line up. It’s the same with the rectangle markers which are slightly wider than the Subs. In effect, these make the watch look sportier and has more lume applied on it. Another thing that greatly differentiates the Seiko SNZF17 from the Subs is the presence of day date display at the right side of the watch. The Rolex doesn’t has the day, instead having a bigger date window with a magnifying glass. The day date display on the Seiko SNZF17 is better in terms of practicality and usefulness as we don’t have to check our smartphones if we can’t remember what day or date today is (happens to me a lot as I grow older LOL). Even though both watches look similar, I found that the Rolex Submariner is a bit more elegant than the Seiko SNZF17. I think the Swiss watch’s smaller elements (e.g hands, markers, bezel font, etc.) make it more pleasing to the eye, looks simpler and yet very attractive. Well, what can you expect from the watch with such a reputation. It’s the hallmark of great design after decades of innovation from the company. The Seiko SNZF17 on the other hand is sportier (it’s a Seiko 5 Sports watch after all) with the bigger hands, markers and font. The day date display, though is very useful, seems to disturb the dial. This makes the watch look busy and make it less pleasing. Which is why I have the opinion that the Seiko SNZF17 is more suited for an everyday beater watch, watch that you can use practically anywhere and anything. The Seiko SNZF17 has a more traditional size of 41 mm made from stainless steel case which I found to be the best size for an average guy’s wrist. It’s not too big and can easily fit onto any wrist, unless of course, you have very gigantic hands. The thickness of 13 mm is not definitely not a thin one, but since this is a sports watch, I think this is acceptable. On top of that, the moderate size makes the Sea Urchin not too heavy to be worn, as compared to other 44 – 45 mm sized watches. The lug width or strap width is 22 mm, a bit wider than the 20 mm straps that I prefer for such a watch. On top of the watch is a hardlex crystal, Seiko’s own version of hardened mineral crystal. But my experience with this type of crystal is it’s a bit better in terms of scratch resistance, compared to the usual mineral crystal. Some online websites will list that it’s scratch resistance or scratch proof but this is simply not true. Only sapphire crystal can be said to be scratch resistant. 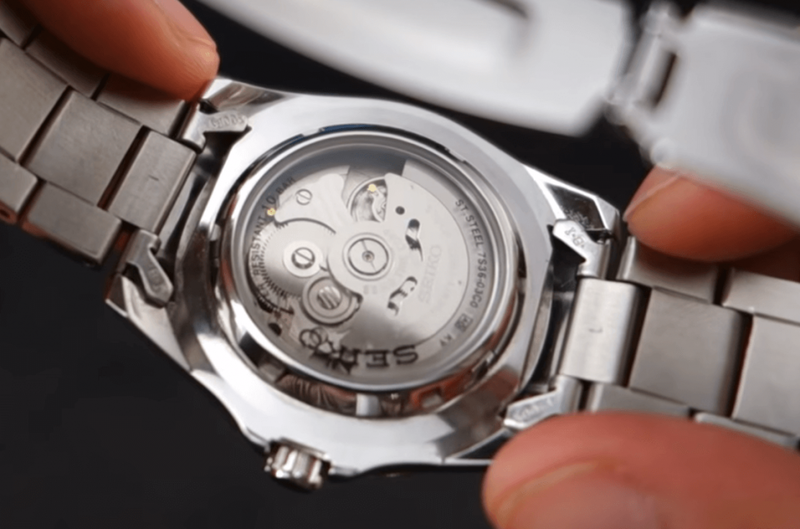 Even so, it’s not that hard to keep the watches from deep scratches as long as you follow the basic rule of avoiding contact between your watch and any metal or hard surface. Apart from the traditional black and white dial design, Seiko also produces the Seiko SNZF15 which is basically the sea urchin but with a blue dial and and pepsi bezel colors. Even though the Rolex Submariner is a diver’s watch, this SNZF17 sea urchin is not exactly a full fledged diver’s watch. It has only 100 m water resistance, and without any screw down crown. The latter caused me to think that this is more to a general purpose sports watch instead of diver’s watch. 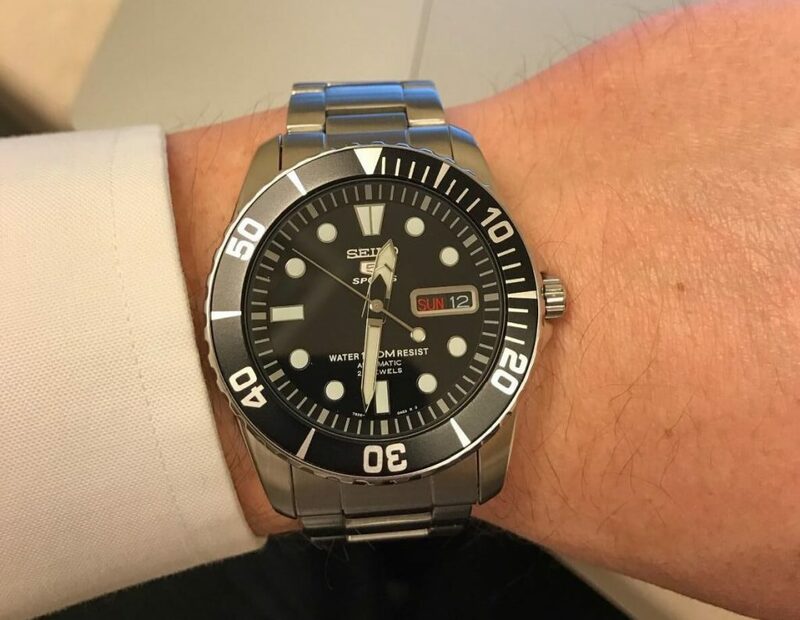 It’s a bit of a let down but then we need to remember that at this price, it’s quite hard for Seiko to make a real diver’s watch (such as the Seiko SKX007). The strap of this watch uses a stainless steel bracelet that’s built good and sturdy. I like how it comes with a double lock clasp with Seiko signature printed on it. The use of double lock clasp gives more assurance as we know the watch won’t fall off accidentally. But on thing that I don’t really like is the use of hollow end links on the bracelet. It’s the connecting piece of the bracelet to the watch that is built of thin plates, instead of solid stainless steel. I found that this hollow end links tend to rattle and create faint metal touching noises when we are moving out hands around. Well, such drawbacks are to be expected for a watch in this price range. Inside the Seiko SNZF17 is the legendary Cal. 7S36 automatic self-winding movement. It’s one of the brands movement that’s has been proven to be robust and reliable. The movement has 23 jewels with 21,600 vibrations per hour or 6 beats per second. It’s accuracy is fairly average, at +- 15 seconds per day. 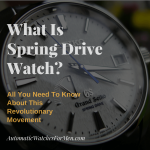 The power reserve of this movement is about 41 hours. Even though the 7S36 movement is a good with proven track record, it’s undeniably an older generation movement from Seiko. The newer movements from the brand are the 6RXX movement (for the higher priced watches, such as the SBDC033) and the 4RXX (inside SRP series watches such as the Seiko Monster). The 7SXX movement series originated from a few decades ago but due to its effectiveness, it’s still around until today. What I don’t particularly like about it is it’s non-hacking and cannot be manual wind. Non-hacking means the watch seconds hand won’t stop when we pull out the crown to adjust the time. For some, this is considered unacceptable since they can’t precisely set the time accurately. But for me, it’s not a very big deal as a minute or two inaccuracy is acceptable (at least to me LOL). It is the manual winding feature that I really miss in the movement. That feature enables us to recharge/tighten the movement’s mainspring, increasing its power reserve just by turning its crown a few times. This makes it easier for us to keep the watch running especially during those times when you just can’t wear it such as wearing your more expensive watch to a formal event. Without this feature, we are left with having to wear the watch to keep it alive. Or the other option is to use watch winder which can actually has the same cost as the watch itself LOL. Problem To Keep It Accurate? One of the main complaints about the Seiko SNZF17 is its accuracy. Some of its owners complain that the watch is not a good timekeeping device and has accuracy problem. Well, in my opinion, automatic watch is already quite well known to not be as accurate as a quartz watch. But again, this is something that not all people are aware of (especially those starting to learn about watches in general), which is why this complains surfaced. Even the most accurate automatic watch, the COSC Chronometer watch can has a +4 or -6 seconds per DAY deviation. Meanwhile, a quartz watch has +-10 seconds per MONTH accuracy. Granted, automatic watch’s accuracy is its weakest point. But the main thing that make it unique is the centuries old movement that’s full of mechanical goodness. There’s no electricity used in there – just gears, springs, rotor etc. to keep it running. And the fluid seconds hand movement as well as the exhibition caseback are the elements that you can’t never get from a normal quartz watch. But should your Seiko SNZF17 has a problem to keep it’s accuracy, say it’s gaining or losing almost one minute per day, then please bring it to your watchmaker to get it adjusted. It won’t take a long time to do, depending on your watchmaker schedule though. Sometimes, the watch can be magnetized which caused it to lose its accuracy. This can happen if you let the watch get too close to a magnetized source, such as speakers, fridge, TV, etc. Who Is This Seiko SNZF17 For? 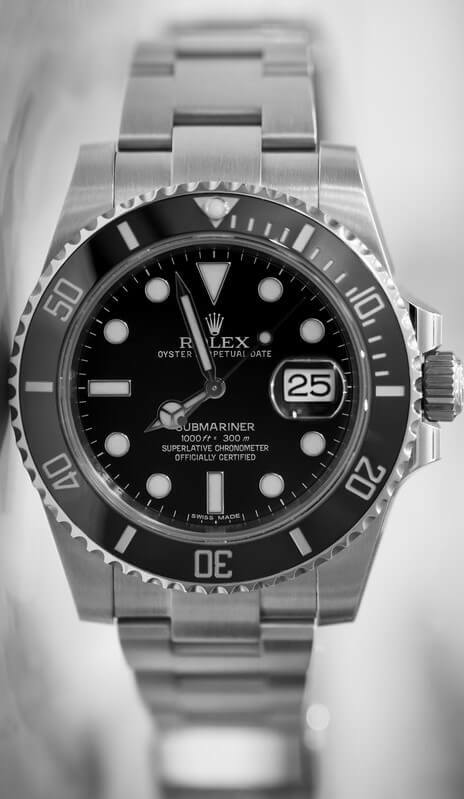 Fancy a Rolex Submariner but don’t have the cash or don’t feel like splurging it on a watch? 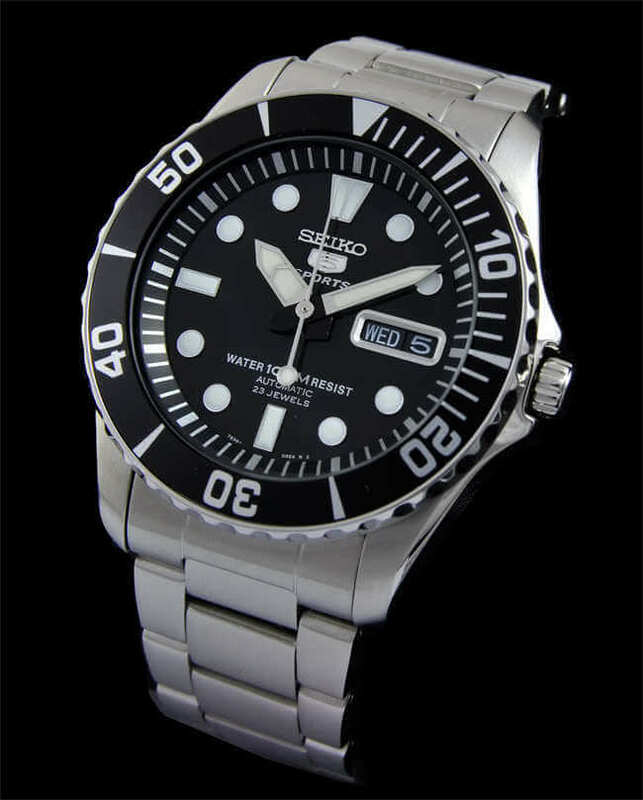 Then this Seiko SNZF17 sea urchin is definitely for you. It’s not like other watches that imitate closely (ehem, Invicta..) but it has the elements with some styling unique to Seiko 5 Sports, making it a watch on its own. It’s affordable price makes the watch a good candidate for those wanting to buy his/her first automatic watch. And since it’s Seiko, you’ll be guaranteed of a good quality timepiece to own. Where Can We Buy The SNZF17 Sea Urchin? Unfortunately, the SNZF17 is quite hard to find at watch stores. The issue lies with Seiko. They only officially import their higher end models (such as the Prospex, Presage, etc.) to overseas. Luckily, we can still buy the Seiko SNZF17 with online retailers. Of these retailers, Amazon usually has the cheapest price for the sea urchin. Click the link to check out the latest price of the sea urchin on Amazon. Who Should Not Get The Sea Urchin? 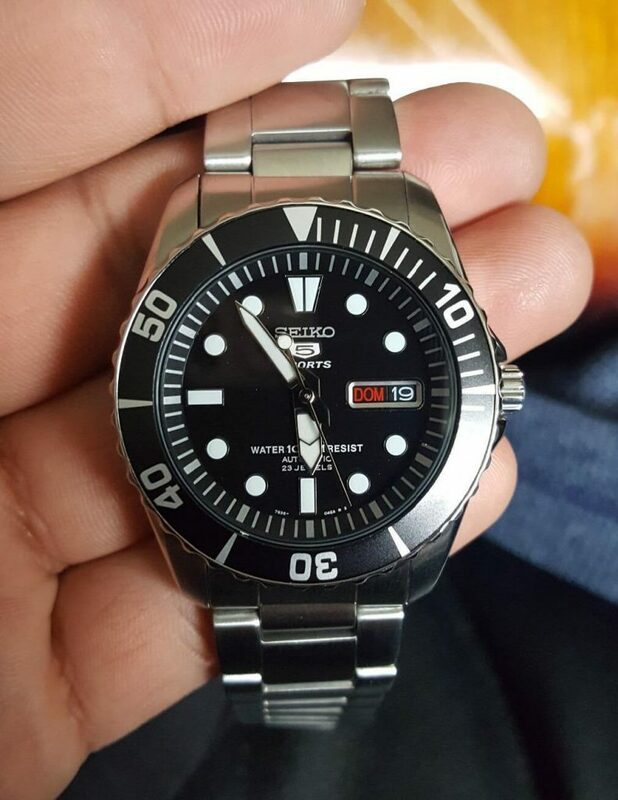 Anybody looking for a real diver’s watch might want to skip this Seiko SNZF17. Even though it has a fully functioning unidirectional rotating bezel and lume, but that’s as much as it gets in terms of diver’s watch. The 100 m water resistance rating is not bad too, but the lack of screw down crown is what makes me feel it’s not a good watch for diving. You can read my list of the best 10 automatic dive watches under $500 to see various dive watch alternatives for the SNZF17. If you don’t prefer the dive watch look, check out this list of the 10 automatic watches under $200 where I’ve also included other types of watches in the list – all for not more than $200. 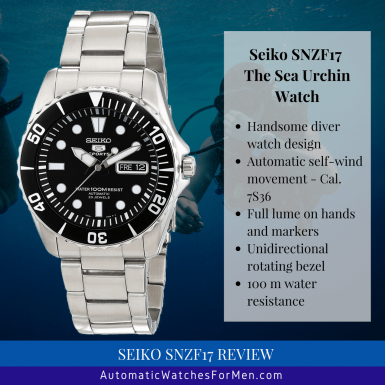 Seiko SNZF17 or the sea urchin is a one of the best affordable automatic watches around. It’s a good solid watch with nice design. And I have to say its affordable price makes it a great choice to be used everyday as a beater watch for any usage. And not to mention its resemblance to the Rolex Submariner makes it a nice substitute. I hope you guys enjoy this Seiko SNZF17 review. Let me know what you guys think about this Seiko sea urchin watch. 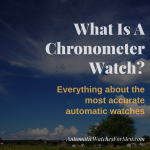 Previous Post: What Is A Chronometer Watch? Just found this review. I could not agree more with the accurate assessment in this article. Have had the exact SNZF17 for 4 weeks from Amazon $148.99 no shipping with Prime. This is my first automatic watch. Others are Casio G Shock (15+ years, work out watch mostly, solid been through usual outdoor, pool, beach sand, no issues on time lost (more later) and each battery lasts for 7 years. Have actually changed battery twice). Total investment probably equal to the SNZF17. The other watch is slim Movado Museum (10+ years absolutely no issues). Have had others that I have thrown mostly ( no kidding). So, that is the background. My concern with the SNZF17 was the weight and shear size 41mm !! had horrible luck with Galaxy watch, my wrist (6.75″) hurt. had to return. I took the plunge and got this watch after measuring the Gshock. Its actually a little bigger! This article is spot on. I also lose time on occasion. But, I have started to shake right 20 times and left 20 times before putting up for the night. Wear every day no kidding for 8 hours at least. So, the time is good (check versus NIST atomic clock on web every 2 days and log). I dropped already (need to remember this is not G Shock!) from counter about 4 feet onto hardwood. It was dead next morning. But I shook and reset and it worked. Then, I rubbed elbows (hit) in rush hour metro actually it was a little more, it knocked someone back pack off (told them sorry).The SNZF17 lost 1 hour. I was upset. Then I found out these watches are sensitive. (Need to remember this is not a Gshock). So, its working fine again. The crazy part (this is like a camera given my research nature). This article is spot on. 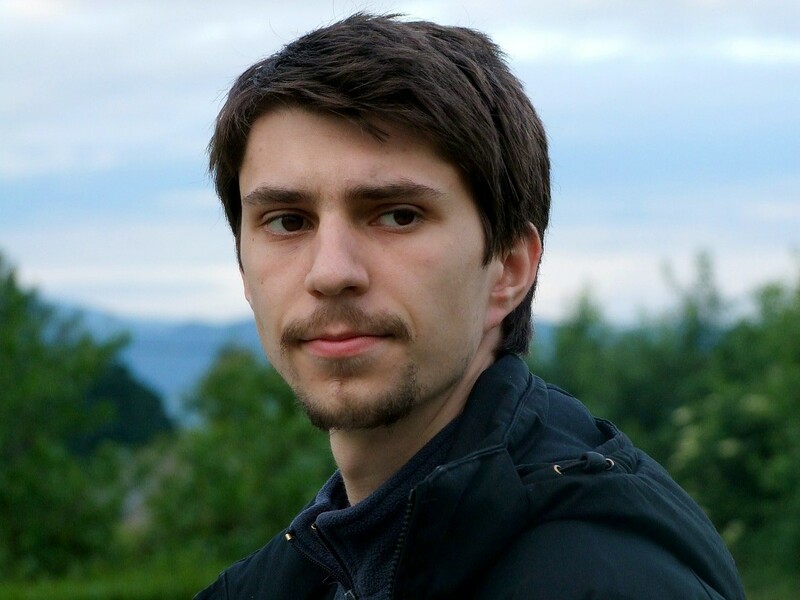 I got a camera then was ready to move up within a month. Same with this watch. Ready for the real turtle. Alas. I am going to keep this one. However, I feel it will run for decades! This thing is solid. I gave the Movado to my wife she has enough already actually. The GShock stays. Cant say enough good about this watch from Seiko. I would definitely get again. The price is a STEAL for the quality and authentic watch making. I am learning more about watches every week. My father has a couple of Rolex. However, I dont want (cant at this time !) spend that much and not like. This watch is really commendable as its exactly as advertised and solid. As shown by my 2 watch stopping activities. It started fine again. The reason the SNZF17 is called ‘Sea Urchin’ is because sea urchins live in shallower depths of the ocean, a reference to the 100m rating of the timepiece, or so I’ve been told. 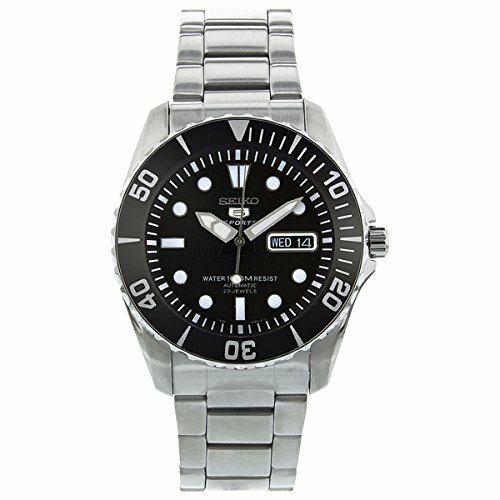 If you spend £50 more on the Seiko 007 / 009 you get a proper dive watch with screw down crown and 200m water resistance. Hi David. That seems like a very plausible explanation. Thanks for sharing bud! For me the blue version (SNZF 13) is the best looking of the lot. Very distinctive. Yes can’t agree more. The design is unique and totally Seiko-like. And that price is just hard to beat for an automatic watch! Very thoughtful review! Thanks for taking the time. As far as a dive watch is concerned, 100 meters is 328 feet (more or less). The rule of thumb is get equipment that will work at twice the working pressure. In other words, if you make regular dives beyond 164 feet, as a commercial diver might, then get something rated for 300 meters or more. The unidirectional bezel is a must for tracking time at depth. However, that’s not as important these days with modern dive equipment that calculates all that depth related stuff. As a recreational diver, the most I went was 143 feet… once. There’s not much to see beyond 80 feet or so, unless you go wreck diving. At least that was my experience. For a dive watch, I like the larger minute hand of the Seiko over the Rolex. For dives, I used a Doxa Sub 300. It had a better bezel for dive related purposes. Your review has convinced me to get one of these. I fully agree. Recently bought one. Might not have the highest / best specs of all (seiko) divers watches, but it’s certainly the best looking! Totally true. And for the sub-$200 price, the Seiko Sea Urchin is definitely a steal! INSIGHTFUL! You’ve obviously spent a lot of time learning and understanding the Sea Urchin. Thank you for your thoughts.